The Greek island of Santorini is known for romantic views, luxury hotels and a dramatic volcanic caldera. Less well known is the island’s original, indigenous cuisine. 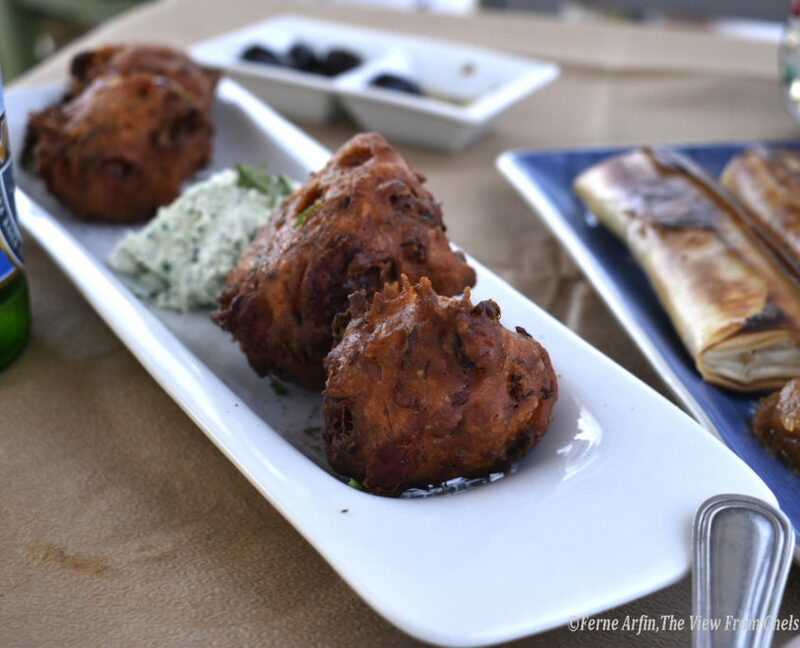 You may find versions of these two dishes elsewhere in Greece, but on Santorini they are unlike anything you’ll taste anywhere else – unless, of course, you make them yourself. A huge natural disaster, more than 3,600 years ago is probably responsible for Santorini’s best local recipes and most delicious native ingredients. That was when the island, the southernmost Greek island of the Cyclades, literally blew its top, destroying itself and the Minoan civilization on Crete at the same time. 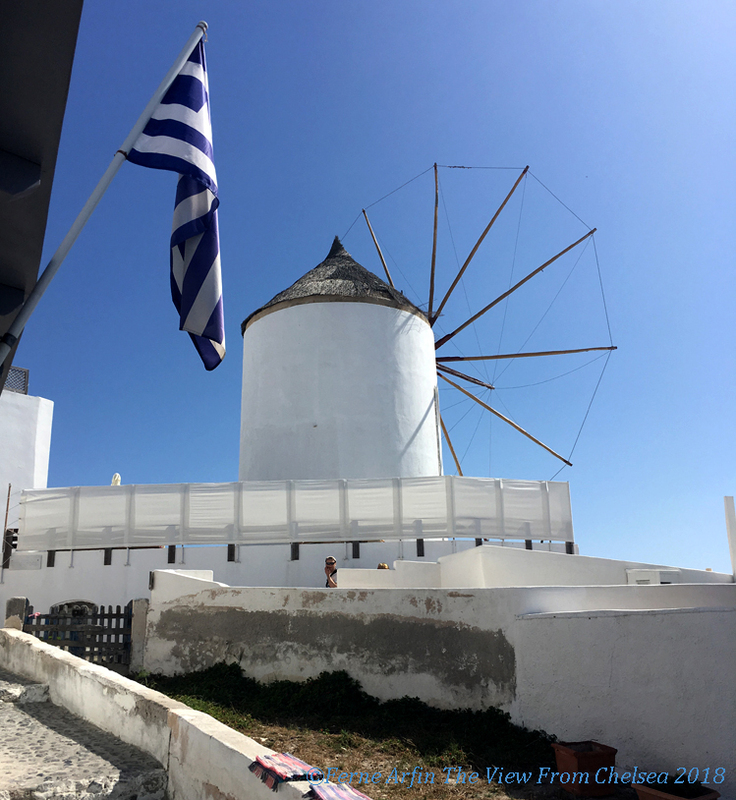 What remains today is a huge, west-facing volcanic caldera with white-washed villages clinging to its dramatic cliffs, and a narrow plain sloping away toward the Aegean Sea. The island is about 11.2 miles long and 7.5 miles wide at its widest point (most of it is barely three miles wide). There’s very little room to pasture livestock or grow animal feed crops. Instead local farmers rely on the island’s rich volcanic soil to support small vineyards (among the oldest vines in the world) and truck gardens where they grow tiny, super sweet tomatoes. Caper berries almost as large as grapes grow wild on the higher slopes as do all kind of herbs. The best Santorini dishes make use of these ingredients. 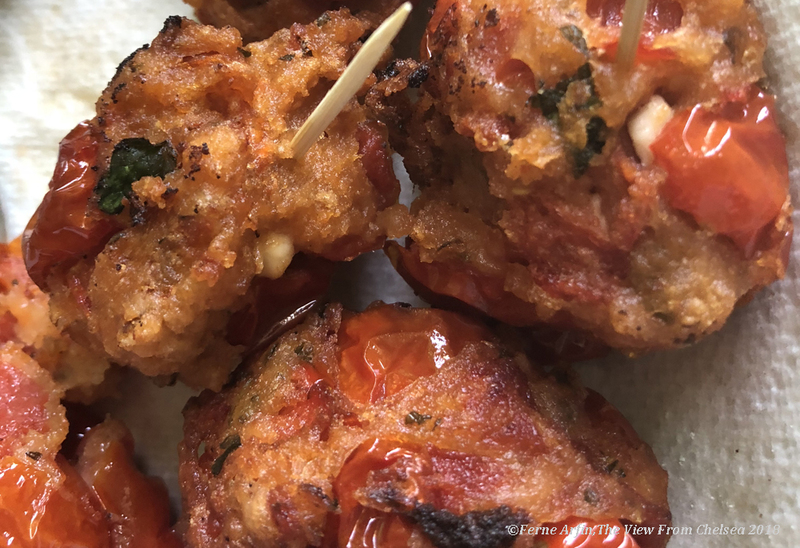 I first tasted these tomato balls (pictured above) at Elinikon, a sunset-facing cafe with a view of a Cycladic windmill from its small porch. It’s an unpretentious place with authentic island cooking. They didn’t share their recipe but my experiments produced a close approximation. The balls make use of small, sweet and meaty Santorini tomatoes in place of beef or lamb. The mini plum tomatoes or grape tomatoes now available at most supermarkets in the summer months are a pretty good substitute. When cooked, the tomatoes keep their color and look like tiny red jewels. The recipe makes enough for generous starter portions for four or five people. Set a mesh strainer, large enough to hold all the tomatoes, over a large bowl. One at a time, squeeze the tomatoes to break the skins and release the juice and drop into the strainer. Sprinkle with salt and leave to drain for half an hour. Mix flour and baking powder with salt and ground pepper to taste in a small bowl. Mix the herbs, onion and Feta cheese. Add the tomatoes and mix well with spoon and fork. Add the dry ingredients and stir with a wooden spoon until a soft dough, capable of being formed into balls is formed. If necessary, add a little more flour. The view from Elinikon, above. Ntomatokeftedes as served at Elinikon, below. 5. Cover the mixture and refrigerate for at least an hour. Three hours is even better or you can leave it over night. 6. Cover the bottom of a large, heavy bottomed frying pan with olive oil to a depth of about a quarter of an inch. 7. Heat gently to a medium temperature. Don’t allow to overheat to smoking point. 8. Use two tablespoons to form balls about two inches in diameter. To serve as hors d’oeuvres, make smaller balls – but be warned, these are fragile and are best eaten off a plate. 9. Fry until golden on each side. Because they have no eggs or other binder to hold the mixture together the balls are prone to crumbling in the cooking. Resist the impulse to move them about with a spatula. When they are browned enough to turn, they will release from the pan. 10. Drain on paper towels and serve with tzatziki (strained yogurt, crushed garlic, grated cucumber and chopped mint) and lemon slices. And, here’s a little trick: If your tomatoes are not meaty or tasty enough, add some chopped sundried tomatoes that have been plumped in water or olive oil and drained. 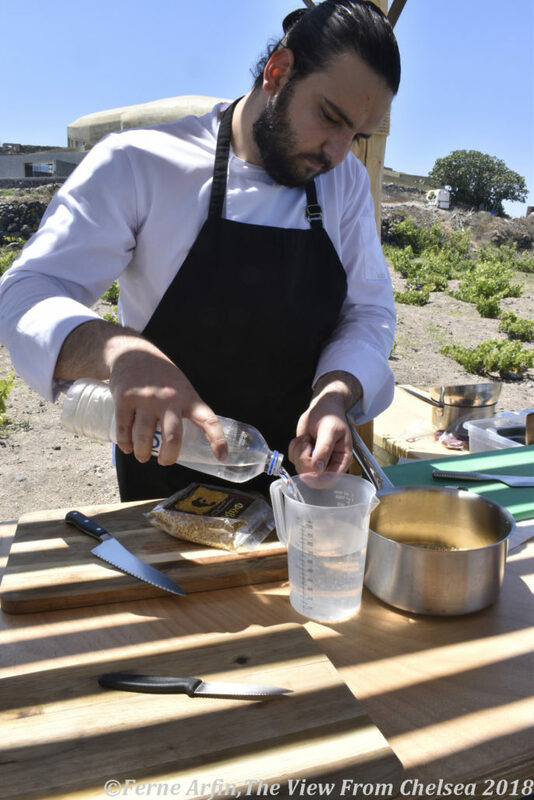 Chef Miltos of Andronis Concept Wellness Resort on Santorini makes the island speciality during a cookery lesson. I thought I knew that fava was a name for Italian beans. On Santorini it is an entirely different dish. It looks like hummus but tastes a bit like mushy peas or pease porridge as it is served in England. 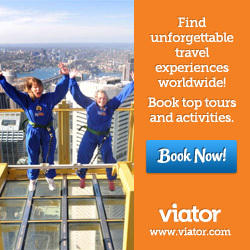 Don’t be put off. Of course it is much better. When I asked what kind of beans or pulses were used to make fava, no one could really tell me. So I bought a packet in a Greek grocery and when opened it I realised that fava are yellow split peas. So if you can get your hands on those, you can make this authentic Cycladic dish. Cooking lessons can be part of your stay at the luxurious Andronis Concept Wellness Resort on the edge of Imerovigli in Santorini. I took advantage of the chance to learn to cook an authentic dish in the open air at the resort. Chef Miltos, pictured here, taught me is mother’s recipe. 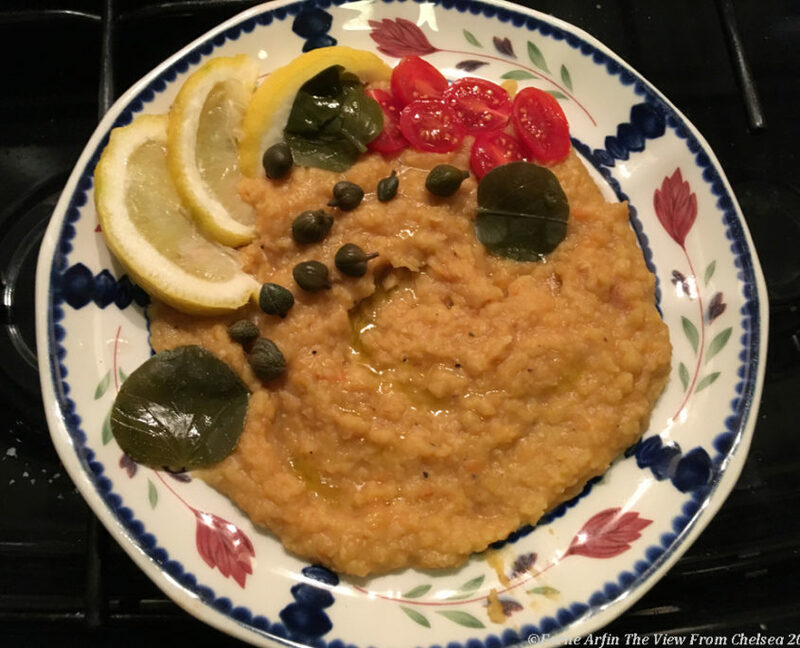 Fava, as served on Santorini, with the island’s giant capers, caper leaves and olive oil. Place yellow split peas, chopped carrot, quartered onion and water in a large saucepan and bring to a boil. Remove from heat and skim off foam that forms of the dust from the dried pulses. Return to heat, bring to a boil then boil gently for 40 minutes to an hour. Add more water if necessary. Test from time to time by crushing the pulses against the side of the pot with a spoon. They should become mashable. While the split peas are boiling, mix the chopped onion with a little oil and lemon juice and set aside to marinate at room temperature. Taste the capers and rinse if they are too salty for your palate. By the time the peas are tender, most of the water should have been either absorbed or evaporated. Drain and reserve what cooking liquid is left. Leave about 3/4 of a cup of water in the pot. With a potato masher or a large spoon, roughly crush the spit peas – still in the cooking pot. Then whip the mixture with a large whisk. At this point, some chefs force the mixture through a sieve or process in a food processor. But Chef Miltos prefers to use a whisk so that some of the texture of the split peas remains. The final mixture should not be too wet or too dry – it’s a bit thicker than good quality hummus. Add more of the cooking liquid if necessary. Arrange the mixture in a deep plate, garnish with marinated onions, halved tomatoes, capers and caper leaves if available. Drizzle with olive oil and serve with spoons and bread. I had a fabulous day wine tasting and cooking in Santorini. We made a few dishes including Ntomatokeftedes (just don’t ask me to pronounce it!) Delicious!! A bit messy to make at home, but really delicious. I brought home some of those huge capers and the caper leaves they have there. Where did you do your cooking? I love the look of your recipe. Merely attempting to pronounce it is a mouthful! Ha ha. Just think of them as tomato fritters. They put an N in front of a T at the start of a word to indicate you pronounce it like a D. So Domato I guess.